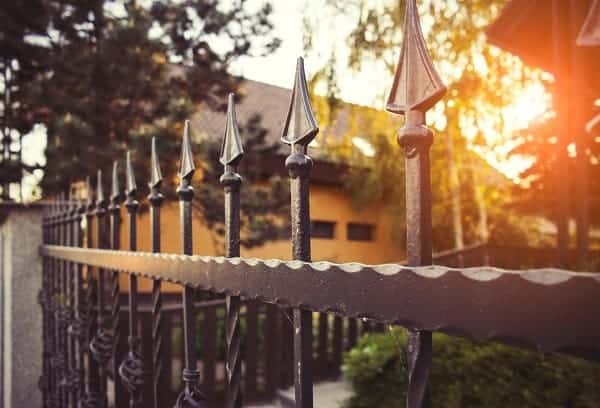 If you’re thinking about ways to improve your property, ornamental ironwork fencing is a logical solution. Aside from creating a distinctive look, it increases security and decreases worry. Tough and durable yet artistic and airy looking, iron privacy fencing isn’t easy to climb over. Although it helps keep your home or commercial building safe, it doesn’t obscure the view beyond. Ornamental ironwork has a long history of being highly valued. The ancient Hittite culture of far western Asia — what is now mainly Turkey — is credited with developing iron smelting around 1500 B.C. Europe’s 3MVET vocational education project notes that the Hittites used ovens lined with clay to extract iron from ore, then hammered it to remove impurities and create wrought iron. It wasn’t until the late Middle Ages in Europe that it was possible to create an oven with a temperature hot enough (2,783 degrees F) to melt iron completely for casting in molds. Gradually, what began as a material for weapons and tools became popular for producing elegant fences. Wrought iron fencing arrived in America with the colonists. According to This Old House, it “guarded only the finest houses, churches and public buildings” until the 1800s when casting made ornamental ironwork more affordable. Spear-top fences. Iron fences are durable and strong arrangements of vertical and horizontal rods. The vertical elements, called “spires,” often are designed with classic spear points to deter intruders. Flat-top fences. These sleek designs can be tall for discouraging intruders from entering residential yards, commercial properties or swimming pools. Short versions offer a smooth handrail along guided paths and keep people from entering off-limits areas, such as gardens. Entry gates for driveways and walkways. A beautifully ornamented iron entry gate protects you while also politely letting people know you value your privacy. Railings for balconies, decks, porches, and stairs. Properly designed railings provide more than decoration. They protect people of all ages from falling off many kinds of raised structures. Garden trellises. Fencing for café entries, gardens, patios, and pools all benefit from the addition of iron trellises. We create them to meet your taste whether you want simple lines or ornate design. Cages to protect air conditioners. Sad to say, but people sometimes steal air conditioners for their copper coils. One attractive solution to this problem is an iron air conditioner cage. Whether you need fencing or other ornamental iron products, Rustic Fence offers the best. We’ve been serving Arlington for more than 50 years and are proud of our integrity as well as our workmanship. Please call us today at (817) 275-2151 or contact us to discuss our top-quality materials, installation and workmanship warranty.